Available space: 3,000s.f. (50’x60′) wood/steel construction on 17,424s.f (132’x132′) corner lot. 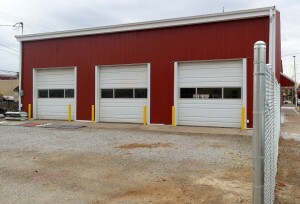 Features: The building is well insulated and was remodeled in summer 2015; radiant-tube heating system, 5 high-bay garage doors with automatic openers, 3-phase availability, and fenced-in lot with two 20′ sliding gates. For more information, contact Eric Galbreath.